Known as a bold, forward-thinking leader, Dr. Curran strategically positioned the University nationally and globally, enrolled some of the largest, most academically talented classes in school history and dramatically expanded the University's footprint during his tenure. "I would call him a thoughtful and innovative visionary in higher education. That’s the best way I can describe his mark," said Steve Cobb, chairman of Henny Penny and a 1986 alumnus and former chair of the University’s board of trustees. "He has these natural intuitive skills that allow him to navigate the complexities of a university — through his demeanor, his knowledge, his social interactions. It's been a pleasure watching him lead our University with a certain finesse that has combined the science and art to decision making and risk taking. If I used just one word to describe Dan, it would be 'transformational.'" When Curran became president in 2002, he said he saw "a well managed university poised for greatness." Since then, the University has nearly doubled its footprint with two major acquisitions from NCR Corp. while changing its enrollment strategy to become a more selective university that attracts most of its students from outside Ohio — and many from around the world. The University's endowment, first-year applications, number of endowed faculty positions and the value of its land and buildings have doubled. Student retention and entering test scores reached all-time highs. Dayton Flyer student-athletes continue to boast graduation rates consistently among the highest in the country, and the overall winning percentage in all sports is better than any other time in school history. "The University of Dayton is academically strong. It’s financially strong. We weathered the rough economic period much better than other institutions and hired excellent faculty," said Curran. As president emeritus, he teaches and conducts research on campus and serves as executive-in-residence for Asian affairs in the University of Dayton China Institute in Suzhou, China. "As I reflect on my presidency, I am most proud of the cumulative successes of our students, alumni, faculty and staff. They have spread the University of Dayton’s excellence and reputation around the world." In an age when a college president serves an average of seven years, according to the American Council on Education, Curran continued a tradition of leadership stability at the University of Dayton. Almost a third of all alumni graduated during his tenure. Approachable and unpretentious, Curran enjoys a warm relationship with students, who call him "Dr. Dan." In the Dayton region, he's widely respected as a catalyst for the renaissance of the southern edge of the city. And faculty say they appreciate the way he boosted faculty ranks by nearly 20 percent and increased the University's national stature in research. In the wake of the recession, the University continued to hire and give salary increases to faculty and staff when many peer institutions across the country imposed hiring and salary freezes. "Dr. Curran has demonstrated a deep commitment to enriching the student experience and student success through his support of faculty efforts to intentionally integrate academic knowledge with experiential learning within and beyond the curriculum," said Carissa Krane, an associate professor of biology who served as president of the Academic Senate, the representative body of the faculty. A sociologist by training, Curran was the first president of the University who was not a Marianist priest or brother, and "I don’t think we could have gotten a better person," said the Rev. Martin Solma, S.M., vice chair of the board of trustees and provincial for the Marianist Province of the United States. "His respect and regard for the Marianist tradition and spirit at the University have been exemplary," he said. "For the Marianists, community is about building relationships, and Dan has done this very well. 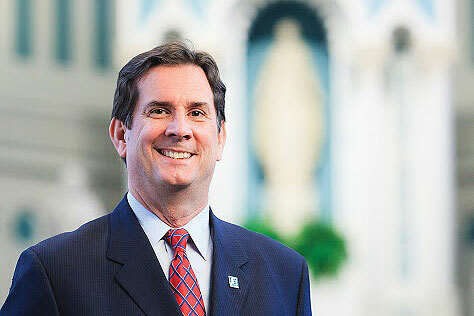 He has strengthened the University of Dayton as a regional and global leader in Catholic education. We’re very grateful for his leadership." Solma expressed appreciation for the partnership Curran established with Holy Angels parish and the $12 million renovation of the Chapel of the Immaculate Conception, funded through private support, which was completed in August 2015. During Curran's presidency, the University launched numerous curricular innovations in law, graduate and undergraduate programs, including advance degrees in high-demand health fields. Curran is the driving force behind the University’s China Institute, a five-story, 68,000-square-foot facility that opened in 2012 in the Suzhou Industrial Park, one of the fastest-growing innovation parks in the world. Largely through Curran’s efforts, Fuyao Glass America Inc., made a $7 million gift to enable the University to purchase the building housing the institute, thus expanding the University’s footprint internationally. Under his leadership, the University developed an innovative tuition plan that eliminates surprises in the cost of a four-year degree, eliminating fees and guaranteeing that any tuition increases will be covered by increasing a student's scholarship. Construction boomed with investments of hundreds of millions of dollars of private funds into new and renovated residential and academic facilities, including the transformation of NCR's former corporate headquarters into a home for the nationally renowned University of Dayton Research Institute. Donors committed more than $300 million in private support, which includes the largest single gift in school history — $12.5 million from George and Amanda Hanley's Chicago foundation to fund curricular initiatives through the Hanley Sustainability Institute. The University emerged as a national leader, partnering with high-tech companies that located laboratories and offices on campus, and provide an invaluable training ground for students. In 2013, GE Aviation opened a $53 million research center — an extraordinary move for a Fortune 100 company — and Midmark Corp. moved its corporate headquarters to the 1700 South Patterson Building. In 2016, Emerson Climate Technologies opened a $35 million global innovation center. "I've been humbled and privileged to lead the University of Dayton during such a transformative time in our history," Curran said.